The SoapBox is not for flame wars, personal vendettas, or for grinding your axe. Trolling will not be tolerated. Anything inappropriate for this forum will be deleted immediately. Re: Affairs - so what? You don't know anything about me, which you've proven over and over. I don't know what that means, but you didn't answer my question. but you didn't answer my question. You are still a Trump supporter even though he is serial liar, cheater, and make the US the laughing stock of the world. I was also an Obama supporter even though I did not vote for him. So? Of course I support my President. What do you want me to do? make the US the laughing stock of the world. That's your side of the story. Half of the world says otherwise. So, I am a liar? Yes. That's what this whole thread is about silly. You claim he was defending the affair itself and that is not true. Hence, a liar. But you did not answer my question. What should I do then? You can just go f*** yourself with your stupid questions. If you cannot see what is happening does not make me a liar. You need to be OK with people not agreeing with you. But again, what do you want me to do regarding Trump? You call people names and insult people that "support" him but can't offer any suggestions. You're just being a spoiled child who did not get their way. I am, except when they call me a liar. Do you get the difference? I very rarely call people names, and when I do, it is because they did call me names. I try to keep it as civil as possible, but there is always an idiot who thinks calling people names makes him right. except when they call me a liar. Simple solution. If you don't want to be called a liar, don't lie. Clearly I've offended you. I apologize. If you were on my end you'd see it was never intentional. I am surprised you won't answer any of my questions though. Well, sort of surprised. You never take an answer for an answer unless you like it. Please don't imply that you answered my question of "What should I do?" - Then you are most certainly a liar. However the American economy is booming, people are being freed from poverty, North Korea is potentially going to de-nuke. When you look at the grand scheme of things you must really hate your country, and must be a really petty person if you would put your personal feelings for one single person above the prosperity of your whole country and world peace. A thread started under Obama. I already stated in the past that I would personally hand Trump Nobel Peace Prize when this happen, if it was in my power to do so. 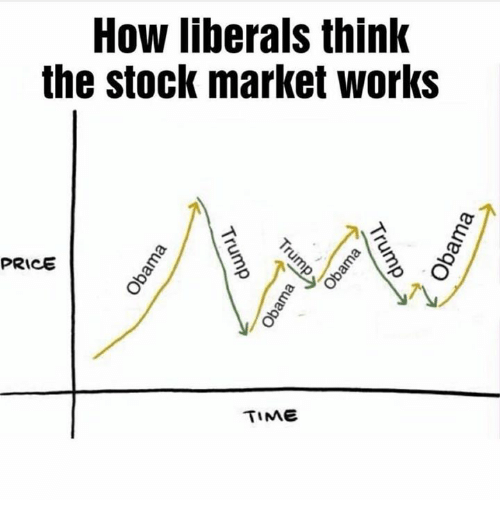 Remember when Obama did a great job at bringing back the economy on its feet and people were still blaming him for petty things? Ok, according to this graphic, Trump and Obama alternate at being President over time. Funny concept. Obama inherited a wrecked country, Trump did not. That's liberal logic for you! Certainly not. And you know it very well. You just thought it would be clever of you to post a stupid graphic you found on the internet. Now I understand why the christian right has it's hand in this - it's having an effect . . .
‭011111100010‬ wrote: This is more proof that the left is attacking things that are not actually there. And you guys keep falling for it. I guess you could say, since he can't (won't is more correct) see a problem because he is "Blinded By the Light". Yet you can't backup the statement either. What you think is not important. But facts are important and the fact is you can't substantiate the claim that he was defending the affair. You have an argument that he was defending Trump, but you have nothing to claim he was defending the affair. Maybe other languages can't handle that complexity so perhaps this is an English issue for you but there is a huge difference between the two. Can't recall anyone condemning the affair itself, except in the context of condemning his general attitude towards women. However paying to hide it before the election is a problem - one that I have seen discussed. All this hubbub over Rice, Clapper and Brennan still having a security clearance is bullsh|t. First, security clearances are valid for a number of years after they are obtained (the number of years is determined by the security classification - confidential=15yrs, secret=10yrs, top secret=5yrs). Before a security clearance can be revoked, the government technically has to perform some sort of an investigation that reveals information leading one to think/assume that the subject of the investigation is no longer worthy of the clearance (new info that was discovered after the clearance was awarded, or info that comes to light that places doubt or a person's "loyalty, character, trustworthiness, or reliability"). I'm not sure that the President cannot personally revoke someone's security clearance, but he can indeed make it happen via executive order. Another (more important) factor to consider when exposing someone to classified material is referred to as "a need to know". Since these guys no longer have a "a need to know", they cannot knowingly read, possess, nor have access to ANY government documents that are classified as FOUO (For Official Use Only) and higher. So, regardless of your security clearance level, if you don't have a need to know the info, you can't access the info. Period. Whether the people cited above have a clearance or not, they are no longer employed by the government, thus they don't have a need to know. Trump should back off - not because it will expose him to yet more ridicule, but because this is a non-issue, and a waste of his time.